Line a cupcake pan with 12 cupcake liners. Set aside. In a small saucepan over medium heat, heat the Coca-Cola®, cocoa and butter until the butter is melted. Add the granulated and brown sugars, and whisk until dissolved. Remove from heat. Allow to cool, about 10 minutes. In a medium bowl, whisk the egg until foamy. Whisk in the cocoa mixture. Stir the flour mixture into the cocoa mixture. Divide the batter into the cupcake liners until each is 3/4 full. Bake the cupcakes until they spring back when pressed, about 18-20 minutes. 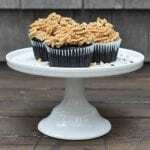 Transfer the cupcake pan to a cooling rack. Allow the cupcakes to cool completely before frosting. In the bowl of a stand mixer fitted with a paddle attachment, combine the confectioners sugar, butter, peanut butter and salt on low speed. Beat until combined then increase the speed to high and beat until light and fluffy. Gradually add the cream by the tablespoon, and beat until the mixture is a medium consistency. Transfer the frosting to a piping bag fitted with a 1/2-inch piping tip. Pipe the cooled cupcakes. Garnish the frosted cupcakes with jimmies, ground peanuts and a sprinkle of salt.